Both Ombre and Balayage are modern hair colouring trends that involve a lightening of the hair from top to bottom. Because hair is darkest near the roots, both colouring methods allow you to avoid the time and expense of frequent touchups. How subtle or dramatic do you want your colour to be? If you want your hair colour to be as subtle and natural as possible, go with Balayage. With this technique, your colourist paints highlights directly onto the front of hair strands, making your hair look as though it’s been naturally lightened by the sun. Ombre highlighting, on the other hand, involves lightening entire strands of hair, creating a block of lighter colour at the bottom part of the hair. Ombre colouring creates a stronger look than Balayage. It can range from subtle to dramatic, depending on the degree of difference between the shade near the top and the shade at the ends. 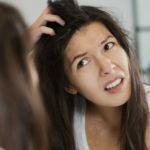 Do you mind hair that looks like it has grown-out roots? While both Ombre and Balayage colouring are applied so your hair colour is lighter on the bottom than at the top, the colour difference is more obvious with Ombre. If you use ombre colouring, it can appear, to some people, that you‘ve let your roots grow out and couldn’t be bothered to recolour them. If this worries you, then balayage is the better choice. Do you prefer wearing your hair straight? Although an expert colourist will avoid creating a demarcation line when applying Ombre colouring, perfectly straight hair can make the transition from a darker to a lighter shade more obvious. Ombre hair can be better suited to curly or wavy hair. Because Balayage highlights are placed only on the front of the hair, there is no obvious transition from dark to light. This means that you can wear your hair straight, wavy or curly. How healthy is your hair? The ends of ombre hair can be very light compared to your natural colour. Going many shades lighter than your natural colour can be very hash on your hair. If your hair is already damaged, balayage, which doesn’t involve lightening as great a portion of your hair, may be a better choice. Still not sure? Call The Hair Boutique the best hairdressers in Exeter, where our hair colour specialist will help you decide whether Ombre or Balayage will suit you best. Call us today on 01392 499162.